Yet every September, when the winds change and fall arrives, we go. For me it is not so much a family tradition as a family obligation. My daughter does not know how I loathe the smells and the sticky rides because I never tell her. I don't want to crush her fun. My husband grins giddily remembering a past filled with cousins and small-town carnivals. I smile along with him, trying to understand the memories. The things we do for love. Corn dogs are typically a safe digestive bet. This one, unfortunately, was not. Photo by Chic Travels. If there is a positive to be found, it is that I typically come away with lovely, colorful photos. 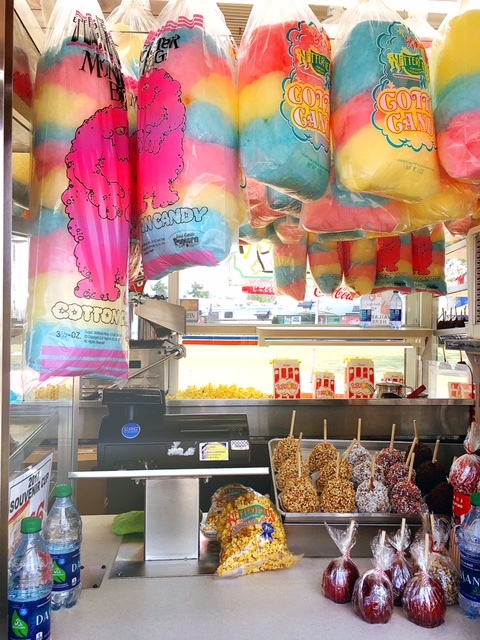 Cotton candy and other goodies. Photo by Chic Travels. Cotton candy, caramel-covered apples, ferris wheels, the prizes at the tables where you throw darts and baseballs -- these elements lend a colorful backdrop to the family picture-scape. When it is all said and done, and I am home again in my comfortable surroundings the pictures bring me joy. Look at their smiling faces? They look so happy. And that is why I go every year. These two people mean the world to me. I love it when the rides, the food and the fun make their day. Do you ever just go along for the ride because you know it makes your travel companions happy? Tell us about it in the comments below!